It's hard to decide which is more frightening--the ';food' teenagers enjoy, or the things they say about their bodies. Whether it's your son's passion for chips and soda or your daughter's announcement that she ';feels fat,' kids' attitude about how they look and what they should eat often seem devoid of common sense. In a world where television and school cafeterias push super-sized sandwiches wh… ile magazines feature pencil-thin models, many teens feel pressured to starve themselves and others eat way too much. Blending her experience as the mother of four with results from a survey of nearly 5,000 teens, Dr. Diane Neumark-Sztainer shows you how to respond constructively to ';fat talk,' counteract negative media messages, and give your kids the straight story about nutrition and calories, the dangers of dieting, and eating right when they're away from home. 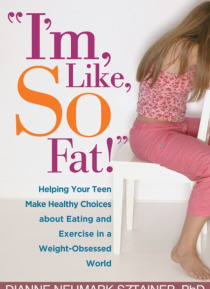 Full of examples illustrating the challenges teens face today, this upbeat and insightful book is packed with great ideas that will help kids everywhere feel better about their looks and make healthier choices about eating and exercise.